DigitalOcean is getting into the container game. While it’s still best known for its affordable virtual private server hosting, the company’s ambition is to become a major player in the cloud computing space. Hosting was just the first part of that plan, and with its Spaces storage services, for example, it signaled its future plans. Since there’s no way to get around talking about software containers these days, it’s probably no surprise that the company today announced the launch of its Kubernetes-based container service. The service is now in early preview (and you can sign up here) and the company plans to make it widely available later this year. 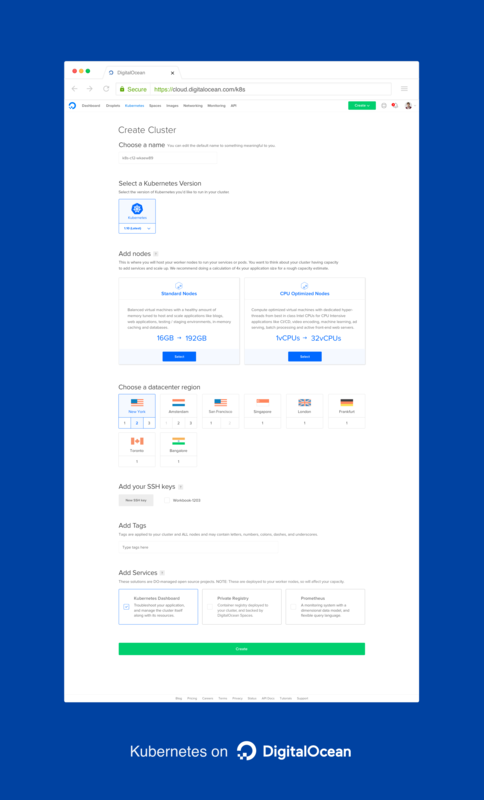 DigitalOcean Kubernetes, as the service is called, will allow developers to deploy and manage their container workloads on the DigitalOcean platform. Like competing products from virtually every major cloud computing provider, DigitalOcean’s offering will abstract away a lot of the underlying complexity of running Kubernetes. Users will get their own isolated Kubernetes cluster with full access to the Kubernetes API if they need it. The service integrates with the company’s existing storage service, firewall tools and other key features. Developers can choose whether to run their containers on standard DigitalOcean nodes or on more high-powered compute-optimized nodes. There also is support for access control through a new “teams” feature, as well as all of the usual metrics and logging features you’d expect from a service like this.